GREEN PEEL® is the original method developed by Dr. med. Christine Schrammek-Drusio – medically inspired, dermatologically efficient – with three new treatment formulas for all application area in the face and on the body at every age. GREEN PEEL® is a biological peeling method that has been used all over the world with great success for over 50 years. With the help of Mother Nature the aging processes of the skin can be counteracted, the complexion refreshed, the regeneration of the skin triggered and the renewal of the skin initiated on a purely natural basis. Under the supervision of trained dermatologist Dr. med. 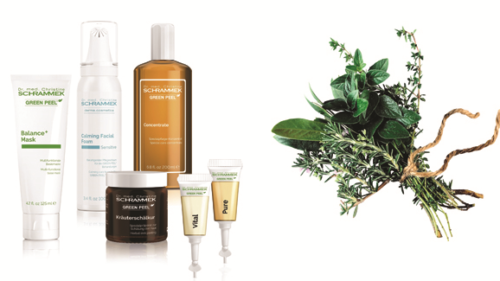 Christine Schrammek-Drusio a compact, professional cosmetics range has been developed with the declared goal of helping skin restore its healthy, beautiful complexion. Starting with the care of norml skin to effective hydration and including solutions for special skin problems, this skincare series offers very efficient cosmetic formulas.